This story originally appeared in AEMERA’s Newsletter, published March 31, 2015. Yellow Rail. Photo: Dave Quady. 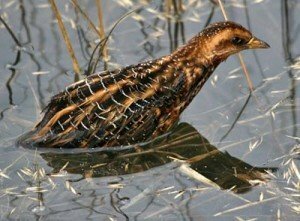 The Yellow Rail is a secretive, nocturnal wetland bird. It’s currently listed as a species of “special concern” under the federal Species At Risk Act for a variety of reasons, such as: it has relatively small population sizes, some of which are in decline, and development is transforming some of its preferred habitats. The Yellow Rail’s elusive lifestyle has also made it hard to study, and thus, relatively little is known about this species. Because of its federal status of “special concern”, oil sands mining projects in Alberta are subject to approval conditions, like the one stated above, that require the development of monitoring and mitigation plans for the Yellow Rail. To meet the approval conditions, in the past, the proponent for each mining project has implemented their own monitoring plans. But the lack of basic biological information on the Yellow Rail in Alberta begged for a regional approach. Key questions needing answers included: how many individuals and populations of Yellow Rail exist in Alberta? Which habitats do they prefer to live in? How sensitive are they to human activity? 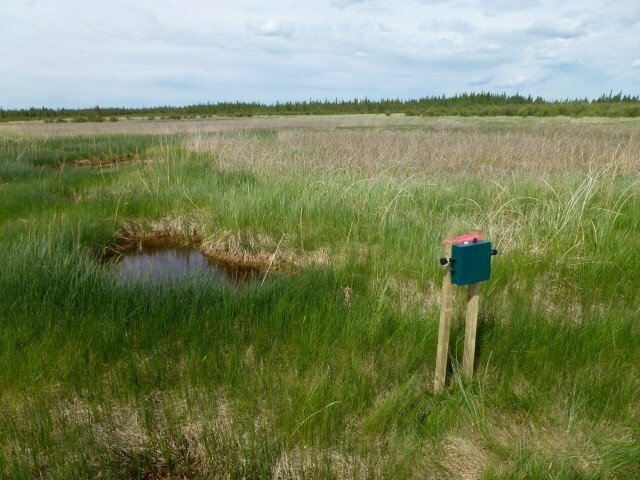 So, in 2012, a consortium of government and oil sands industry representatives (the Ecological Monitoring Committee for the Lower Athabasca) was established to—amongst other goals—sponsor and guide the development of a regional monitoring program for the Yellow Rail in the Lower Athabasca region. With the input and cooperation of the consortium, between 2012-2014 the Alberta Biodiversity Monitoring Institute (ABMI) and the Bioacoustics Unit led by Dr. Erin Bayne from the University of Alberta collaborated to develop and test Yellow Rail monitoring protocols and design a long-term monitoring program that was consistent among leases and integrated with regional monitoring. One of the early successes of this collaborative effort was the demonstration that automated recording units (ARUs)—an audio recorder that can be mounted to trees and posts, and programmed to record at specified times for several days or weeks at a time—could be used to monitor Yellow Rails. Since birds vocalize (make sound), ecologists use the unique call of each species to identify its presence in a given location. ARUs have many benefits over traditional monitoring approaches that rely on a human observer accessing often remote locations under difficult conditions to listen or record bird calls for a short period of time (often 10 minutes per site). For one, by virtue of collecting data over several days or weeks, and at different time intervals, the likelihood of detecting a Yellow Rail if present, is much greater. In 2013, ARUs were deployed into habitats predicted to be preferred by the Yellow Rail. With the aid of automatic sound recognition software developed by the project team to isolate Yellow Rail calls, 60 new Yellow Rail locations were identified in 2013 alone, which amounts to more detections in one year than in the past 15 years of monitoring in Alberta! 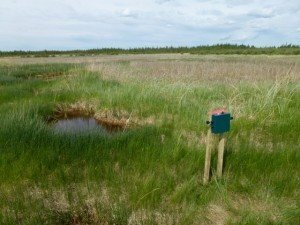 The resounding success of the 2013 field season convinced oil sands companies and government regulators to implement ARU monitoring on oil sands leases. A Yellow Rail Working Group has been established to coordinate their efforts. All operators use the same listening protocols and design to ensure the data could be integrated into the larger regional monitoring effort. Activities such as these help companies meet their related approval conditions. After the 2014 field season, the ABMI/University of Alberta collaboration had gathered enough data to address some of the outstanding questions regarding Yellow Rail biology. For example, data show that this species prefers to live in graminoid fens and meadow marshes with a water depth between 0 and 20 cms. Also, it appears that 12 discrete populations of Yellow Rail currently call the Lower Athabasca home. This information is being used to develop effective mitigation and/or reclamation plans for the Yellow Rail (another condition of company approvals). Top photo: Whitefish Lake, AB. Photo: Jason Straka. Learn more about the ABMI’s acoustic recording work here!